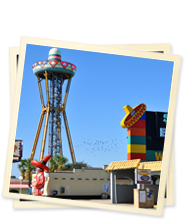 South of the Border has dedicated itself to the hospitality of our many guests for years. Striving to extend that hospitality to those in need, we started The Border Foundation, a non-profit organization providing and overseeing funds to many charities. The Border Foundation donates monies annually to both local & regional charities. Organizations like The American Red Cross, local Fire Departments and programs dedicated to helping families who are victims of domestic abuse receive aid. We understand that our business thrives only if there are healthy & happy families thriving as well.